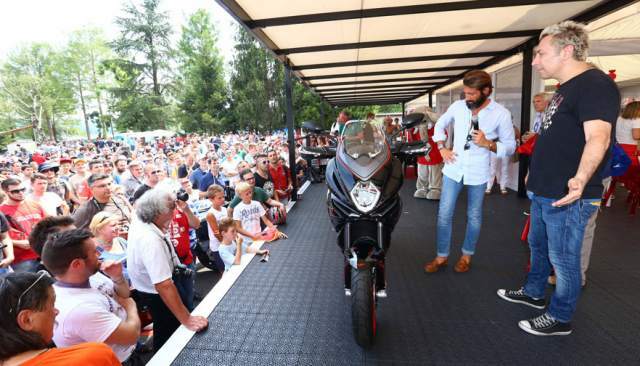 THREE new 1000cc MV Agusta’s are on the way for 2016, said MV’s CEO Giovanni Castiglioni. The revitalised litre range will include a successor to the F4 superbike, the Brutale super naked and also a crossover (perhaps along the lines of BMW’s S1000XR). The bikes will feature new styling and updated engines and could be ready for unveiling in November at the EICMA show on MV Agusta’s doorstep in Milan. The announcement was made by Giovanni Castiglioni at the ‘Friends of Claudio’ meeting in Italy, according to Italian magazine OmniMoto. The annual event honours the life of MV, Ducati and Cagiva's former president Claudio Castiglioni who died in 2011. MV’s four-cylinder bikes have recently been over-shadowed by the success of its three-cylinder 675cc and 800cc models, so the revitalised litre range couldn’t have come at a better time. News of an updated superbike will also be music to the ears of British rider Leon Camier, who represents the manufacturer in World Superbikes. Currently Camier is struggling in 16th position in the championship standings. It’s hard to believe the F4, styled by legendary Italian designer Massimo Tamburini, is already 16 years old. The F4 RC, unveiled earlier this year, still looks fresh as a daisy so its successor will have giant footsteps to follow in.